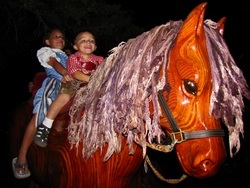 Meet some of our favorite rockinghorse riders! 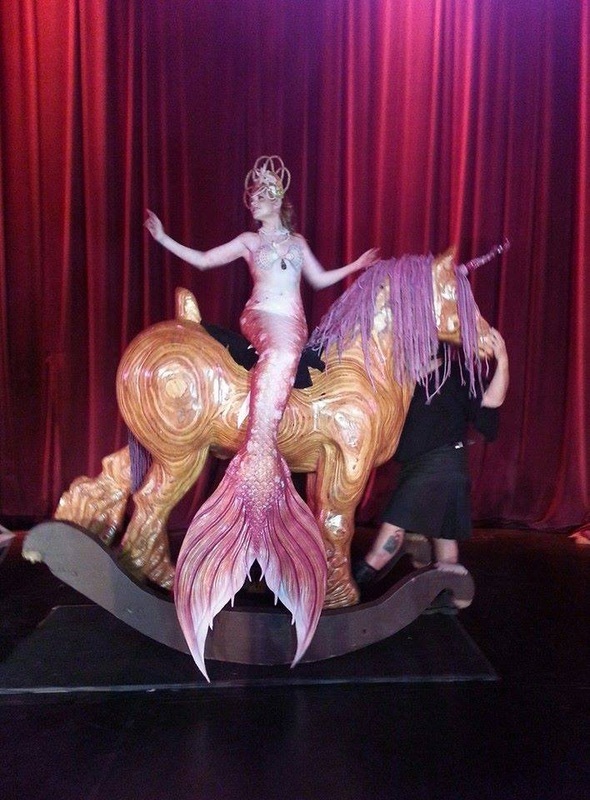 And you thought mermaids rode sea horses! Nope, GInger the Koi Queen rides Vlad the unicorn as her royal steed. The handsome young fellow in the front sporting the goatee was one of the patrons at the Excalibur Medieval Tournament in Arcata, CA. 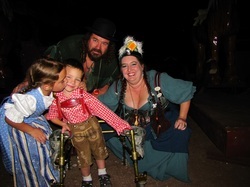 He enjoyed watching his sisters ride Vlad so when their ride was over we picked him up out of his wheelchair so he could join in on the fun. The joy we got from helping him ride is immeasurable, and I'm thinking he'll not soon forget this adventure. Ride on good sir! This truly delightful couple was on a dinner date at the Greektown restaurant in El Cajon when we happened to be there with the horses. It didn't take them long to decide they wanted to go for the ride of their lives, and I'm sure it made their date very memorable. We certainly had fun meeting them and introducing them to Vlad and Freya! You never know how someone is going to react when they climb onto Vlad of Freya's back for the first time. Some love it and laugh and giggle through their ride, some quietly enjoy it, I suspect transported back to childhood memories, and some scream in sheer terror before relaxing and genuinely enjoying their ride. This wonderful photo captures such a range of reactions that it will forever remain one of our favourites. We met this inspirational young man and his doting older sister at the Big Bear Oktoberfest. He's one tough little three year old who has already overcome far more than many adults. At the tender age of two, when most children are balls of energy, he contracted a virus that left him paralyzed from the neck down. He spent a long time on a ventilator and has since fought his way back to recovery. When we met him, he was coming down the dusty street in his walker, expending a ton of energy on each step. When he fell and faceplanted he didn't cry a bit, just got back up and kept on going with determination. We just HAD to give him a free ride, and I'm honestly not sure who enjoyed it more--him or us. He rode nestled between his older sister and Freya's neck, with Lester serving as a safety belt on one side. He still doesn't have the best muscle control, but we kept him safe so he could enjoy his ride. Enjoy he did! He was waving one arm in the air and yelling Yippee Kai Yay for the whole ride! We have faith that he'll make a full recovery since he's come so far and lets nothing get in the way of his goals. 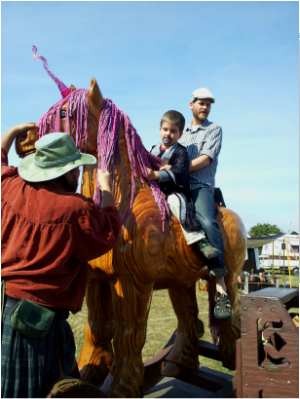 Lots of Rockinghorse love to you, little cowboy in leiderhosen! Have loads of fun with your beautiful big sister! We were both delighted and honoured to meet you both.